Well, it’s been a while. But don’t worry, foodies, your favourite clumsy vegan cook is still alive and well. Talking of clumsy, today approximately the 697th accident in my life happened: I spilt a jar of rose petals all over the carpet. *facepalm* I joke about my clumsiness, but honestly that’s probably the most exciting thing that happened to me today. That, and the creation of this orange and rose polenta cake. Okay, the latter is significantly more exciting. And tastier. Polenta, also known as cornmeal to those across the pond, is coarsely ground dried corn. It might sound a little weird as a cake ingredient, but it gives polenta cake its signature texture, and a rich flavour. This grain is so understated, and maybe that’s why I love it so much. It may not have the high status of other grains (I’m looking at you, quinoa) but is still rich in nutrients. What’s in a polenta cake? Let’s talk a little more about this polenta cake. It’s light but still a little dense, sweet but not too sweet, and has subtle hints of orange that’ll have you coming back for another bite before you can finish the first one. And most importantly, it’s soaked in orange juice after baking, which adds extra sweetness and moisture. 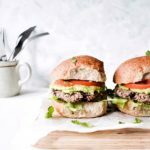 How to make eggless cakes: a mini guide to vegan egg replacements! Tofu – this works great as a ‘faux’ egg in this tofu scrambled egg recipe. 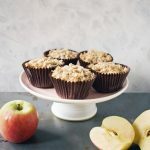 Applesauce – perfect for these apple crumble muffins. Lemon Juice + Baking Soda – this is the least overpowering egg replacement, which is great for recipes like these vegan chocolate cupcakes. Mashed Banana – a key ingredient for my vegan pancakes! If you follow me on Instagram, you’ll know they’re my favourite. This just goes to show, you really don’t need eggs to make delicious cakes and treats. Whatever your dietary status, I do hope you try vegan baking. It’s a lot of fun and nowhere near as scary as it sounds. It’s also the perfect activity for this time of year, when the weather gets colder and you are craving something warm and comforting. Trust me, there’s nothing more comforting than eating a slice of this cake when it’s fresh out of the oven. Actually, add watching Netflix to that ensemble and you’ve got a pretty good day. Polenta cake is something I have always wanted to make, but never got round to doing. Let me tell you, I am so happy I did make this polenta cake, as it is now one of my favourite things. Hopefully it can become one of yours too! Add the soy milk, vegan butter, vegan yoghurt and 2 tablespoons of the orange juice to a large bowl and whisk together. Add the polenta, flour, sugar and baking powder to the bowl, and whisk well to combine. Pour the mixture into a 23cm cake tin which has been greased and lined with greaseproof paper. Bake the polenta cake at 180 degrees for 25 minutes, or until the top is golden and a skewer inserted comes out clean. Brush the remaining 2 tablespoons of orange juice onto the cake, then leave to cool for 5 minutes before removing from the tin. optional: Decorate with orange slices and rose petals. This recipe yields a cake with a subtle sweet flavour. If you prefer a sweeter taste, you can either increase the sugar to 150 grams, or soak the cake in sugar syrup rather than orange juice. Hi! Shivani. Thank you very much for this awesome rose and polenta cake recipe! My family and I loved it very much! I made it and it turned out very fluffy with right sweetness! II did not have rose petals. I use coconut oil, zest of one big orange and some dry coconut flakes. And instead of orange juice, I use cointreau liquor(in and out). Very delicious! Definitely this cake is gonna be one of my favorite cake recipes! Hi Nargiza, I am so happy to hear that you liked it!! Using coconut sounds like a super tasty addition too!